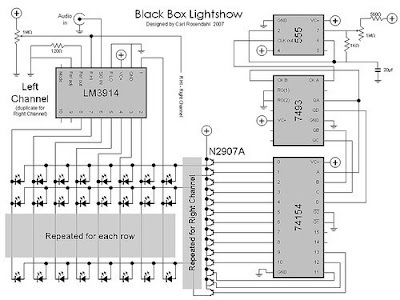 Black Box Lightshow Circuit Here's the circuit for the Black Box Lightshow. I'm pretty sure it's right. And now, an explanation: The LED array is shown here as individual diodes, though I used six 5x7 LED arrays, each one is 2" tall. They are arranged as 14 rows and 15 columns. The left channel is 8 columns and the right channel is 7 columns. The extra column from the left channel is the center column and gives nice symmetry. Not shown here is that on the right channel, the first column (pin 1) is not used so that the other columns are equal. 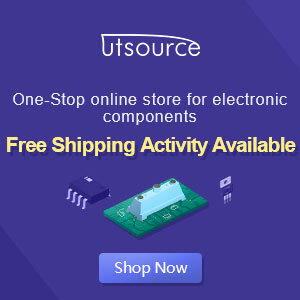 The LM3914 is a Dot/Bar Display Driver. It does all the heavy lifting of converting the audio signal into a series of bars - these are typically used as digital meters. The potentiometer sets the sensitivity of the display. 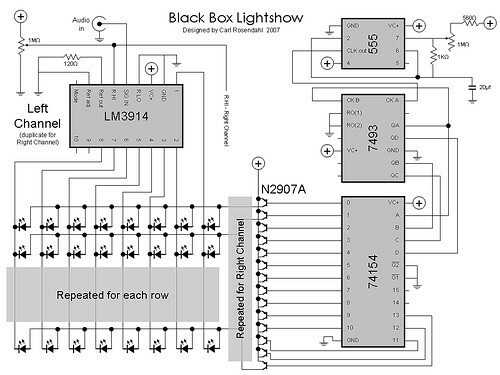 Since the rows are multiplexed (see below), each column is only driving one LED at a time. I only show the left channel here, the right channel is identical, and they share the level setting potentiometer. The right portion of the diagram is a 555 clock, a 7493 4-bit counter and a 74154 4-to-16 line decoder/demultiplexer. This is the "sweep" part of the display that cycles through each row of LEDs. The potentiometer at the top controls the sweep speed. The net result is that the 74154 is cycling through the pins/rows, grounding each in succession. Note that I only have 14 rows, but it is counting to 16 each time. No big deal, it doesn't affect the perceived output at all. The N2907 transistors are there to provide enough power for all the LEDs. Potentially, all 15 LEDs in a row can be lit up at once, so the transistors make sure there is enough juice. Unfortunately, I lost the original plans during a garage cleaning after I built the electronics (the box took another few months before I got around to it). I opened it up and reverse engineered my own work. I won't guarantee it, but it sure looks right to me. The one weird thing I found is that I don't have power going to pin 8 of the 555 (as shown here), but it works fine - go figure. Also, I'm not 100% sure I got the polarity of the LEDs right, sorry about that. I would recommend testing that out first.